Everything to know about traveling to the Philippines for business or vacation. Visa requirements, flights, best hotels, best resorts, tourist attractions. Despite its proximity from Metro Manila, the town of Tanay in Rizal province is often overlooked by tourists. Not many people know that within just a little over an hour of travel from the Philippines capital, they can enjoy this town's refreshing natural sceneries, cooler climate, and adventurous atmosphere that can relieve stress for those who really need to really escape the city. #1 - Mt. Daraitan and Tinipak River: Located in the Sierra Madre Mountain Range, Mt. Daraitan is popular not only to expert hikers but also to newbies because of its easy hike. The summit can be reached in only about 3 to 4 hours. The trail wouldn't be complete without exploring the Tinipak River which features large marble and limestone rocks. #2 - Palaya Natural Farm: Originally a dragon fruit plantation, this 66-hectare farmland opened its door to the public to let people experience mother nature at its finest. They claim to produce "the greenest, the sweetest, and the freshest gifts of nature." Overnight accommodations in huts and tents are available and they also have a restaurant that serves delicious dishes using farm-to-table ingredients. 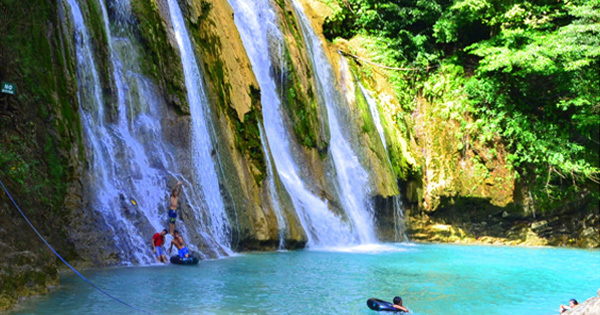 #3 - Daranak Falls: One of the most famous tourist spot in Tanay, expect it to be a bit crowded especially in the summer season. Locals and tourists alike love swimming in the cool water, having a picnic, or just sightseeing. #4 - Batlag Falls: Enjoy some quiet time in this more secluded place just minutes away from Daranak Falls. Unlike the latter, it has a higher entrance fee which means there are fewer people swimming. The falls is relatively smaller than Daranak but the water is just as cool. #5 - Parola Lighthouse: Built in the 1950s, the lighthouse located on the shore of Laguna Lake still functions as a lighthouse. Visitors are allowed to climb up the lighthouse and even though it is not that high, it offers a panoramic view of the Laguna Lake and the whole town. It is also a great place to witness sunset and sunrise. #6 - Masungi Georeserve: In the nearby town of Baras, this conservation area and discovery trail set amidst karst landscapes can be found. The obstacles including hanging bridges, a giant hammock, viewing decks, cob-web like platform, and many more, are not for the faint heart but it surely is a great adventure that could be shared with friends and family. #7 - Tanay Adventure Camp: A usual place for team buildings, Tanay Adventure Camp isn't only a place for adventure but also a great place to learn leadership and teamwork skills. There are outdoor activities such as wall climbing, zip line, paintball, paragliding, among others. Accommodations are also available for overnight stay. #8 - Calinawan Cave: This cave, which used to be a hideout for the Filipino revolutionizers during the Japanese and American colonization, is now a popular destination in Tanay often visited together with Daranak or Batlag Falls. It consists of several chambers and majestic rock formations which are naturally beautiful. These Top 5 Affordable Beach Resorts in Bataan Will Blow Your Mind! Get FREE Travel News About the Philippines! Copyright © 2010-2019 The Philippines Tourism Board | All Rights Reserved.